Need jobs in your community? Fighting fracking or other pollution? Want to have our democracy returned to the people? This educational and inspirational screen saver is for you. Available for Mac and Windows. 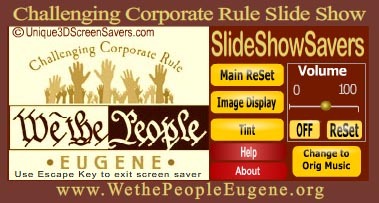 50 Slides about Corporate Personhood, Corporate Rule, Citizens United, We the People–Eugene and most of the major players in this realm of law and civic discourse. Soothing music accompanies vibrant images of activists and scenes of their battles against corporate rule. Please share our message with your friends and colleagues! Now you can have inspirational sayings, eye catching images and research tools on your desktop in your quest to understand and challenge corporate rule in America. 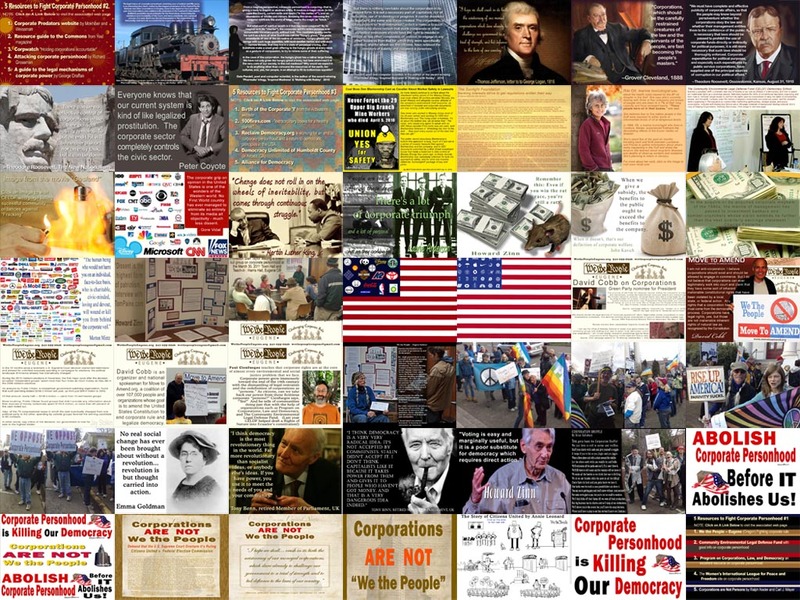 Challenging Corporate Rule has 50 slide presentations with excerpts from speeches, links to resources, history of corporate personhood and much more. Music is a stirring yet light string rendition. Full features including selectable duration of images and transitions, tinting of images, sound mute and volume control. User can choose to show or hide slide controller and can also toggle between automatic or manual slide presentations. Screen saver contains 17 high quality transitions and random display of slides and transitions.